Perhaps I started my journey toward becoming a storyteller when I recorded my father telling that story. I have long admired those who can stand up and tell a complicated story from memory. And now that is what I do. I am originally from the western foothills of Maine, in Oxford County. I have now lived for many years on the coast of Maine, in Hancock County, near Acadia National Park. Summers were long and hot when I was young. There was not much to do besides read, and that was my favorite pastime. The town library was made of stone and was one of the coolest places to be on a hot day. The limit was six books at one time. I went every week and took six each time. What did I do for work? As a young person I did babysitting. While in high school I did housekeeping for Edna Emery, wife of local builder Keith Emery, and then worked for Stan and Hazel Perham, in Perham’s Maine Mineral Store, in the jewelry department. I learned the names of many gems and minerals, from Maine and around the world. What did I like to do, besides reading? Draw! In the 1970s I studied art with Lajos Matolcsy, a Hungarian painter who taught a traditional way of drawing and painting. I studied oil painting, scratchboard, pencil and colored pencil drawing. In 1985, I wrote my first children’s book. It was about a Maine bear. I could envision the illustrations, but I could not realize them. I worked in a small bookstore owned by Katie and Roy Whitehead, Books-N-Things, in the 1990s. When I became the children’s book buyer for the store, I decided I wanted to write and illustrate children’s books. In 1996 I entered the College of the Atlantic in Bar Harbor, Maine, to study art, writing and many other subjects. I wrote and illustrated my first picture book as my senior project. In 2000 I graduated from the College of the Atlantic with a degree in Human Ecology. I wrote my first story for young people in the winter of 2009. It is a story about my great-grandfather. (Remember I said my father learned a story from his grandfather? Yes, that one!) It blends three of my interests – history, genealogy and writing. I wrote my second chapter book for 7 to 12 year olds in the winter of 2011. It is a continuation of the story of Jack, one of the characters from my first chapter book. It is set in the American west and is fiction. One of my Storytelling performances is about my great-great-great-great grandparents. I dress like my (4x great) grandmother and tell the story as if she were telling it. Of all the arts I have practiced over the years storytelling is at the top of the pile at this stage of my life. Maybe that’s because I am able to combine so many of my interests by researching and telling historical tales – history, genealogy, reading, writing, photography, drawing and painting, sewing, knitting, and probably more! If it is the hardest most satisfying thing I have ever done, that is the thing I most want to be doing! 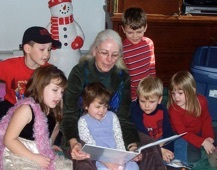 Jude at Christmas, several years ago, singing each of her grandchildren their own special song.